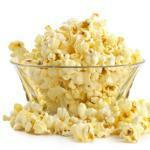 Perhaps history's most enduring snack food, popcorn has amazed generations of eaters. No other food is quite as fascinating, especially in this modern age: We throw a bag of tiny, hard kernels into the microwave, and after a few minutes and hundreds of explosions, we get a huge pile of soft, fluffy balls each more than 20 times its original size. To understand how this magic happens, we need to know a little about the properties of steam. In all substances -- solids, liquids and gases -- molecules are always moving. As a substance gets hotter, the molecules possess more thermal energy and move faster. In a solid, the molecules are simply vibrating. In a liquid, molecules have so much energy that they eventually escape into the atmosphere as steam. And as steam gets hotter, the gas molecules float off in every direction. If they've got enough space, the molecules of heated steam will float farther away from one another, and the gas will expand in volume drastically. Steam can expand to about 1,600 times its original volume. Without the room to grow, the heated molecules will continue to bounce around vigorously -- hitting surroundings harder and faster as the temperature rises. This pressure gets very powerful very quickly, which is why it's a good idea, for example, to puncture the skin of a potato before you heat it in the microwave. The natural moisture inside the potato will turn to steam, and it needs an avenue of escape. Without one, the pressure builds up until it's too strong for the skin, causing the potato to explode. A potato can't handle the pressure, but a popcorn kernel is the perfectly designed vessel to withstand such a steamy explosion. A kernel's hard, cellulose shell (or hull), called the pericarp, encloses the starchy endosperm, which surrounds the germ. Both the endosperm and the germ contain moisture. The optimal popping kernel contains about 13.5 percent moisture. Too much, and it'll pop into a disappointing dense sphere. Too little (due to a leaky hull), and you'll get one of those sad kernels that doesn't pop at all. A proper kernel will explode at about 400 degrees Fahrenheit (that's about 200 degrees Celsius). This is the point at which the pressure becomes too strong for the hull to take. It bursts, and the kernel turns inside out -- literally -- as the starch expands into a piece of delicious, fluffy popcorn. So next time you chomp down on this popular movie-time snack, thank the physics of steam and pressure.